It is no secret that Volkswagen is a leader in vehicle safety innovation. 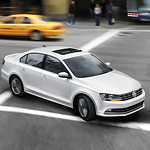 Boasting a host of innovative and modern safety features, the all-new 2019 Volkswagen Jetta is no exception to this industry dominance. The patented Intelligent Crash Response System (ICRS) is triggered when the airbags are employed by turning off the fuel pump and activating the hazard lights. The Automatic Post-Collision Braking System works to slow down the vehicle after a crash in the event that the Jetta does not come to a full stop on its own. The Volkswagen experts and enthusiasts at Brunswick Auto Mart are well-equipped to answer all of your questions about this popular compact sedan. Our team of friendly associates is eager to demonstrate to you all of the active safety features of the new 2019 Volkswagen Jetta as you take it out for a test drive. We look forward to serving you today.